Cormac Reilly is about to reopen the case that took him twenty years to forget … The stunning debut novel from your new favourite crime writer. Betrayal is at the heart of this unsettling small-town noir and the Ireland it portrays. 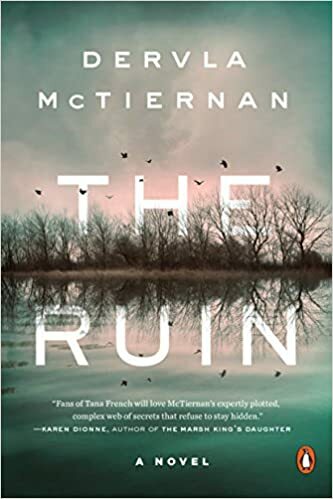 In a country where the written law isn’t the only one, The Rúin asks who will protect you when the authorities can’t – or won’t. The good news is that the sequel is already in the pipeline. It’s a very engrossing book for an experienced author, let alone a debut novel. The hero of the novel, Cormac Reilly, is a fairly senior detective in the anti-terrorist unit in the big city of Dublin, who realises that the elite unit is about to be considerably downsized, and applies for a transfer to the small town of Galway, partly to accompany his partner, who has been awarded a 3 million Euro grant to lead a research project. He’s assigned to lead the cold case investigation unit. He’s worried that even after a month in the new job, his colleagues treat him as a pariah. Even an old friend’s behaviour worries him. And then his superior assigns a 20 year old death for him to investigate. One he investigated in his first week as a policeman, and recommended that it ought to be investigated further, but was told that to bury it. The author introduces Google Timeline as an anachronism in order to advance the plot (the novel was set in 2013, and Timeline was introduced in 2015) because, as the author notes in the afterword, she needed some way for one of the characters to track the movements of her partner before he’d been murdered (and declared, wrongly, by the police to have committed suicide). And being able to find his iPhone on a walking track in a National Park. I’m not certain whether that would have worked. I have been trying Timeline for the past few days (albeit on an iPod ), and today it had me walking to the middle of Lake Monger in Perth despite actually being on a train 500 metres to the East. Kept me engrossed. Enjoyed the plot, characters & setting. Looking forward to another Cormac Reilly episode. Keep up the good work. It’s a rollicking tale, which sweeps you along and keeps you turning the page. Not great literature but like much of Scandi crime novels, provides a pleasant distraction without any gore or shock.